Refresh the brand image to effectively compete in the high-end, exclusive boutique hotel marketplace. Develop marketing pieces that would allow the client to accent their unique historic traits, while showcasing their modern facility amenities. Create and execute an integrated marketing reach on a very tight budget that extended from brand identity and print advertising to various collateral pieces, a web site refresh, and e-newsletter components. Orbit Creative updated the brand logo. We also created a color palette and signature typeface palette that would be implemented in all marketing pieces, maintaining synergy and brand recognition. To meet their tight budget, we developed a series of post card mailers for their various target markets: Business to Business; General Occupancy; Wedding clientele. We also developed a series of small space ads, web banner ads for bridal sites, and a series of e-promotional mailers. Orbit Creative helped to effectively increase the bookings of meeting, special event, and wedding clients with the portfolio of marketing pieces and advertising across print and web. 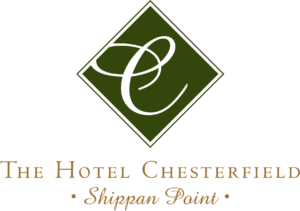 The exclusive location of The Hotel Chesterfield, in Shippan Point - the southernmost neighborhood in Stamford, Connecticut, located on a peninsula in Long Island Sound, coupled with its historic significance and grandeur, prompted it to subsequently be converted to a private residence.